Many plants thrive in the presence of the sun, but there are numerous houseplants that flourish in low lit areas. Plants that prefer minimal lighting often suffer an adverse effect when placed in direct sunlight. In most cases, indoor plants that grow well in low light are hardy in nature and tend to grow easily with a minimal amount of care and maintenance. The hardy cast iron plant (Aspidistra elatior) is aptly named for its ability to handle all types of indoor and outdoor living conditions. A great choice for low-lit indoor spaces, this low-maintenance, bushy potted plant with dark green leaves grows to about 12 to 24 inches tall and wide, and it flourishes with minimal care in almost all environments. The plant's appearance is enhanced with proper care, but it is still able to thrive despite very little light, high and low temperatures, lack of water, drafts, general neglect and dust accumulation, according to the website Plant-care.com. Slightly moist soil is preferred, but the plant can survive for over a week without being watered. Typically, watering once every 7 to 10 days is sufficient. Snake plant (Sansevieria trifasciata), also commonly referred to as Mother-in-law's tongue, is a very common houseplant. The rigid dark green leaves are bordered with yellow and grow vertically to a height of 3 feet to 4 feet. Snake plants can grow in extremely low light, and if given too much light, they can become discolored. The snake plant is very hardy and grows easily with very little care; however, it will suffer if over-watered or if exposed to temperatures below 60 degrees. Dry soil is an absolute necessity. This plant should only be watered once the soil is completely dry, according to the website House Plants for You. This is especially true in the winter or during colder weather. The Chinese evergreen (Aglaonema), also known as the silver queen, is appropriately named for its pretty foliage, which is a combination of dark green and silver. This very easy-to-grow indoor plant can tolerate a range of lighting conditions, but it grows particularly well with very low light, often to a height of about 3 feet. The plant will suffer if placed in direct sunlight. Soil should be kept scarcely moist at all times; if the soil become too wet, the leaves will start to turn yellow. The Chinese evergreen prefers warmer conditions, and it should be shielded from cold drafts. If the temperature drops below 55 degrees, the leaves will begin to brown, according to the My Indoor Houseplants website. Stalks should be cut to promote lush and full foliage. 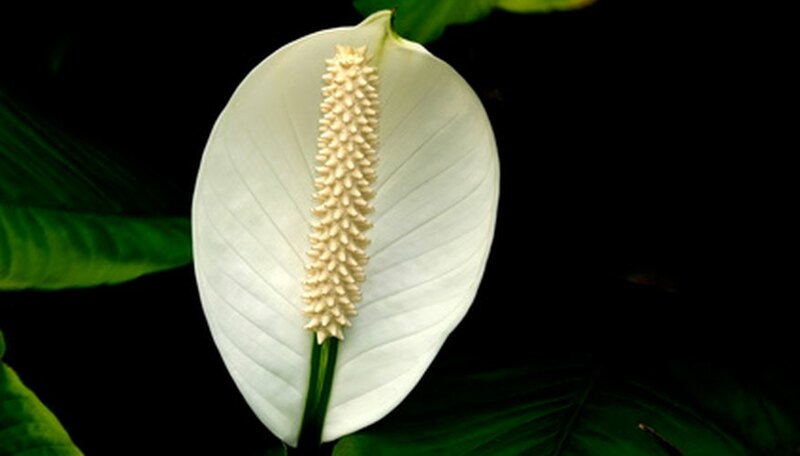 The peace lily (Spathiphyllum) is a pretty plant with dark green foliage and pretty white blossoms that bloom at the top of the stems. These long-lasting, fragrant flowers are initially light green and turn white as they age. The plant can grow to a height of 5 feet and a width of 4 feet. Peace lily requires very little light and is best positioned approximately 8 feet away from a window, according to the website House Plants for You. They can also survive quite well in a windowless room. If exposed to direct sunlight, the leaves will turn yellow and die. Soil should be moist, but not wet. While the peace lily is resilient, overly wet soil damages the root systems and causes the plant to die. Generally, watering once a week is sufficient.